Turn your Mosin-Nagant or PSL into a proper deer rifle with this 7.62x54R soft point ammunition from Wolf. 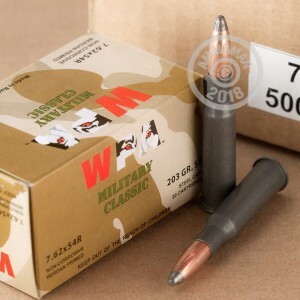 These cartridges fire a 203 grain soft point bullet at a muzzle velocity of 2,380 feet per second and deliver high diameter mushrooming upon contact with an animal. In the hands of a reasonably skilled shooter, these rounds can bring a deer down just as easily as whiz-bang loads costing several times as much! 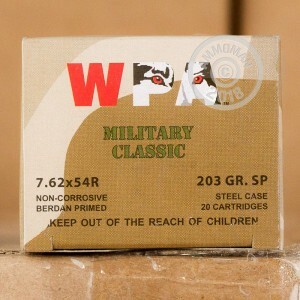 This ammunition is loaded in Russia using non-corrosive Berdan primers and non-reloadable steel cases. The bullets have bimetal jackets and may not be suitable for indoor ranges, so choose your sighting-in location carefully. 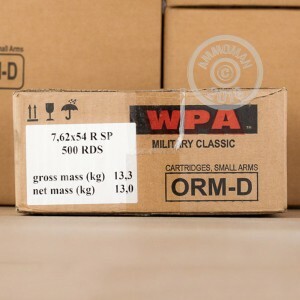 Grab a few of these 20 round boxes or any items totaling $99 or more at AmmoMan.com to get free shipping!